Everyone agrees the tropical rainforests are worth more alive than dead, but our economic and political systems still fail to reflect that, with devastating results. 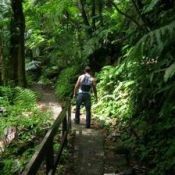 Earlier this month, Rhett Butler of mongabay.com took stock of the emerging market mechanisms for protecting the world’s largest rainforests. His findings are reproduced in Ecosystem Marketplace. Everyone agrees the tropical rainforests are worth more alive than dead, but our economic and political systems still fail to reflect that, with devastating results. Rhett Butler of mongabay.com takes stock of the emerging market mechanisms for protecting the world’s largest rainforests. 13 January 2009 | Environmentalists have long voiced concern over the vanishing Amazon rainforest, but they haven’t been particularly effective at slowing forest loss. In fact, despite the hundreds of millions of dollars in donor funds that have flowed into the region since 2000 and the establishment of more than 100 million hectares of protected areas since 2002, average annual deforestation rates have increased since the 1990s, peaking at 73,785 square kilometers (28,488 square miles) of forest loss between 2002 and 2004. With land prices fast appreciating, cattle ranching and industrial soy farms expanding, and billions of dollars’ worth of new infrastructure projects in the works, development pressure on the Amazon is expected to accelerate. Given these trends, it is apparent that conservation efforts alone will not determine the fate of the Amazon or other rainforests. Some argue that market measures, which value forests for the ecosystem services they provide as well as reward developers for environmental performance, will be the key to saving the Amazon from large-scale destruction. In the end it may be the very markets currently driving deforestation that save forests. Is Forest Carbon the Answer? Hope for avoiding the worst outcomes in the Amazon increasingly rests on the belief that markets will soon pay for the services provided by healthy rainforests. These services—which include biodiversity maintenance, rainfall generation, carbon sequestration, and soil stabilization, among others—have traditionally been undervalued by markets, but there are signs that the situation is changing. A major development was the decision at the 2007 United Nations Framework Convention on Climate Change (UNFCCC) talks in Bali, Indonesia, to recognize forest conservation as a means for reducing greenhouse gas emissions from deforestation, which accounts for roughly one-fifth of emissions—more than the entire transportation sector. Excluded from receiving carbon credits under the Kyoto Protocol, the “reducing emissions from deforestation and degradation” (REDD) mechanism found new life in 2005 as a result of efforts by the Coalition for Rainforest Nations, a group of tropical countries that seek to be paid for the carbon stored in their forests. The idea has since gained momentum as a wide range of interests, including the private sector, development experts, policymakers, and environmentalists, have embraced REDD as a means to fund forest conservation and poverty alleviation efforts to the tune of billions of dollars per year while, at the same time, fighting climate change. REDD was a hot topic of discussion at last month’s UNFCCC meeting in Poznan, Poland. Still despite its promise, REDD remains controversial and faces many challenges, including concerns over land rights; the establishment of baselines to measure reductions in deforestation rates; “leakage” when conservation measures in one area shift deforestation to another; providing sufficient incentives in “low-deforestation” countries which might lose out from REDD; and ensuring that local people see benefits. Further, because REDD is not yet sanctioned under an international framework on climate, credits from avoided deforestation are limited to voluntary markets where they are worth substantially less than carbon credits in compliance markets. 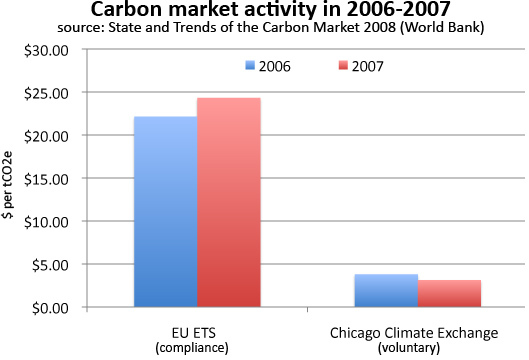 For example, credits on voluntary markets like the Chicago Climate Exchange currently trade at an 80-90 percent discount to the European Union’s Emission Trading Scheme (EU ETS). A political framework on REDD, coupled with binding limits on greenhouse gas emissions and measures to address the underlying drivers of deforestation, will be critical to getting REDD off the ground. REDD operates on the premise that developing countries should be compensated for reducing emissions from deforestation and degradation. Beyond this, the details – including the forests and countries included in the scheme, reference levels for measuring emissions reductions, distribution of funds, and financing – are still being negotiated during a series of UNFCCC meetings culminating in this year’s Conference of the Parties in Copenhagen (COP-15). In essence REDD projects draw funding from a pool of money generated through donations, investors seeking to profit from the sales of carbon credits, or auctions of carbon credits in compliance markets, depending on the model. The funds are used to finance initiatives that promote direct forest conservation, reduce emissions from deforestation and degradation, and/or possibly involve enhancement of carbon stocks through reforestation or other activities. Ostensibly REDD offers the potential to make forest conservation pay for itself, but as past adventures in conservation have shown, it takes more than money to make conservation effective – namely forest preservation efforts must directly benefit local communities. Development experts say that REDD initiatives are doomed if they exclude local people and fail to address the underlying drivers of forest degradation and destruction. To date, discussions laying the groundwork for proposed forest conservation financing schemes like REDD have largely excluded those who will be most affected by their implementation: rural populations living in and around forests, including indigenous people. As a result, while such mechanisms could ultimately benefit forest-dwellers, many indigenous groups strongly oppose measures to use forests as giant carbon offsets. Their opposition will likely continue until they play a greater part in determining policy. Chief among their concerns is the potential for a “land grab” whereby governments, carbon traders, and speculators secure rights of the ecosystem services provided by forests without the consent of the people who live within the forests. In places where land rights are poorly defined, such claims could be used to evict forest people from lands upon which they have been living for generations. Therefore the development of policy mechanisms like REDD will involve thorny issues like traditional land rights as well as broader questions on how compensation will be structured and what measures will effectively conserve forests without driving more people into poverty. In the end, there is little doubt that support from forest people will be critical in making “avoided deforestation” schemes a reality. These points were recently emphasized in a set of guiding principles for including forests in climate change issued last month by the Forests Dialogue on Climate Change, a coalition consisting of more than 250 representatives of governments, forestry companies, trade unions, environmental and social groups, international organizations, forest owners, indigenous peoples and forest-community groups. Dr. Daniel Nepstad, a leading tropical forest ecologist who now heads up conservation at the Gordon and Betty Moore Foundation, says that while these fears are valid, REDD may offer a better alternative than the status quo – which has long led to the displacement of native peoples from their lands at the hands of developers. Still other groups are taking a harder line, opposing any incorporation of REDD into international climate policy until the rights of forest people are determined and other issues are worked out. “It is alarming that such dangerous forest carbon trading proposals are getting traction at the UN talks while so many critical questions are left unanswered,” Kate Horner, Friends of the Earth US climate campaigner, said in a statement following the group’s release of a critique on the World Bank’s Forest Carbon Partnership Facility, an initiative to kick-start REDD projects. Concerns over rich countries using forestry to cheaply “buy their way out” of reducing emissions are not new. The inclusion of REDD-like mechanisms in the 1997 Kyoto Protocol was held up by this very issue with environmental heavyweights like WWF leading the opposition. The group, along with other campaigners, argued at the time that “avoided deforestation” would allow developed countries to meet emission reduction requirements without cutting emissions from industrial sources, including power generation, construction, agriculture, and transportation. WWF and other avoided deforestation opponents feared that rich countries would be “let off the hook” by simply paying tropical countries to cease forest clearing, instead of pushing energy efficiency, pollution controls, and other measures. In the meantime, deforestation continued unabated, with Indonesia and Brazil alone losing some 300,000 square kilometers of forest — an area the size of Italy or the Philippines — since talks in 2001 officially excluded avoided deforestation from the Kyoto Protocol. WWF’s opposition in the face of ongoing forest destruction sparked a bitter rift among environmentalists, but at an “avoided deforestation” policy meeting in New York this September, WWF’s president and CEO Carter Roberts said it would now support efforts to get forests recognized as a critical component of addressing climate change. “In Kyoto, WWF was pivotal in keeping forests out. We have changed our position,” he added. REDD advocates are also winning support from non-traditional partners, including humanitarian organizations, faith-based aid groups, governments – led by Norway, which has pledged hundreds of millions of dollars per year to tropical forest conservation – and the World Bank, which has launched its own program to seed REDD projects. Nevertheless critical elements are needed to getting REDD off the ground, including a framework for forest carbon, strong commitment from polluting countries to reduce their emissions, and effective strategies for implementation, says Johannes Ebeling, an analyst for EcoSecurities, a carbon-trading firm. Once a framework is in place, there needs to be “sufficient and reliable demand from carbon buyers – industrialized countries and their domestic industries – for carbon credits, including forestry credits,” says Ebeling. This requires both “ambitious reduction targets” and the possibility to use external credits – including forestry credits – to meet a portion of these targets. Dr. Philip Fearnside, a leading researcher at the National Institute for Research in the Amazon (INPA), agrees that serious reductions are needed to both address climate change and make REDD viable. “If the world’ s governments become serious about controlling global warming, they will have to make much larger cuts in their net emissions than they have so far – lowering emissions to something on the order of 80% below 1990 levels,” he said. Nepstad, along with Schwartzman and Moutinho, believes that having a strong policy framework would prevent REDD credits from flooding the carbon market, thereby triggering a catastrophic drop in carbon prices that would undermine incentives for renewables and energy efficiency initiatives. Preliminary research suggests that once a framework for develops, pure economics alone may boost REDD. In areas where infrastructure is poor and carbon stores are high, REDD may offer attractive economic returns relative to conventional logging and agricultural use of forest land, especially for rural communities, which are often bypassed by industrial development of rainforests. For example, a study by CIFOR and the World Agroforestry Centre (ICRAF) showed that Indonesia currently is seeing benefits of $0.34 per ton of CO2—mostly from agriculture. By comparison, EU carbon prices are presently more than $20 per ton. Meanwhile, research by Dr. Daniel Nepstad at the Woods Hole Research Institute has found break-even points of less than $5 per ton of carbon for forgoing development of most of the Amazon. Cattle ranching — the leading driver of deforestation in the Brazilian Amazon — has offered significantly less than that in the past. Further, because REDD is compatible with sustainable harvesting of forest products, low-impact ecotourism, and other environmental services payments, it could become an integral part of rural development schemes. Taking REDD into account, the Woods Hole Research Institute estimates that reducing deforestation in the Brazilian Amazon to nearly zero within a decade would cost $100 million to $600 million per year, an amount lower than the opportunity cost of forgone profits from deforestation-dependent agriculture and ranching. In other words, REDD could offer the most cost-effective way to end deforestation. The Eliasch Review, a British government-commissioned report on avoided deforestation, estimates that a cap-and-trade system that includes forest carbon could generate $11-19 billion per year by 2020 to finance forest conservation. The funds could potentially halve global deforestation rates. Seeing the enormous potential of REDD, governments and investors are already positioning themselves for a forest carbon market. Several models are emerging for financing and distributing carbon, ranging from profit-driven investor-backed projects to Brazil’s massive Amazon Fund. Variations and hybrids of the models abound. Last December, the entity formerly known as Merrill Lynch became the first major US bank to invest in an avoided deforestation project, putting $9 million towards rainforest conservation in Sumatra. The bank hoped to lock up forestry carbon credits while they were cheap and sell them at a higher price in either voluntary markets or should they emerge, compliance markets. The deal, brokered by Australia-based Carbon Conservation between Merrill Lynch, Flora and Fauna International, the provincial government of Aceh and others, could generate up to $432 million in gross carbon financing over the next 30 years by preventing logging and conversion of Ulu Masen forest in Aceh province for oil palm plantations. Benefits from the deal are expected to extend well beyond the bank – Aceh Governor Irwandi Jusuf sees the initiative as a key step in the region’s recovery from the devastating 2004 tsunami and three decades of civil war. To support the project, Irwandi has imposed a moratorium on logging, hired more than 1,000 former fighters as rangers, and laid out plans for the development of “forest compatible environmentally sustainable business, such as improved post harvest technologies, community-services for the nature tourism industry, forest tree and fruit tree nurseries,” according to the Project Design Note. Management and administration will be conducted largely at a local level through traditional community leaders. Since the unveiling of the Aceh deal, investor-led REDD projects have mushroomed around the world. Many of these operate as partnerships between local communities, governments, development agencies, NGOs, and carbon investors. The World Bank is helping jumpstart projects in more than two dozen countries with its $300-million Forest Carbon Partnership Facility which builds capacity for countries to earn compensation through REDD. Brazil, which is home to more than 60 percent of the Amazon and accounts for nearly half of tropical forest loss on an annual basis, has a big stake in any mechanism that rewards reductions in emissions from deforestation. The country is among the world’s top five emitters of carbon dioxide when emissions from land use are included — roughly sixty percent of its emissions result from deforestation. While conversion of the Amazon and neighboring ecosystems for industrial agriculture has played a key role in the country’s rise as an industrial power, Brazil is increasingly worried about the impacts of climate change and forest loss, which could devastate vast areas of farmland and put its energy supplies at risk. Sensing an opportunity to capitalize on worldwide efforts to fight global warming while simultaneously protecting elements of its economy, Brazil has proposed the establishment of voluntary fund into which developed countries, companies, and other entities pay to finance a program to reduce emissions from deforestation. With complete control over how the funds are used and no allocation of conventional carbon credits to contributors, the initiative maintains Brazil’s sovereignty over the Amazon and gives it an unprecedented financial incentive to preserve the region’s forest cover. The fund aims to raise $21 billion by 2021. Although some have questioned the voluntary nature of the concept, Norway has committed up to one billion to the scheme by 2015 contingent on Brazil’s success in reducing deforestation. Others – including Wal-Mart – are rumored to be mulling contributions. Brazil has been vague on how the funds will be used but the Bolsa Floresta program in the state of Amazonas could serve as a model for compensating rural populations for avoiding activities that result in deforestation. The program, launched last year, includes pays forest families living near Uatuma Reserve about $25 per month to not clear primary forest lands in return for making ‘no smoke’. Residents are also provided with health care, clean water, and greater access to education. Fearnside added that he things the Amazon Fund will need to move beyond a voluntary model. “The Amazon Fund is a positive development, but I believe that funds based on mandatory commitments will be a firmer basis for slowing deforestation from 2013 onwards,” he said. But the potential doesn’t end with REDD. Investors are already betting that forests will be worth more than the carbon they store. In March a private equity firm took the unprecedented step of purchasing the rights to environmental services generated by a 371,000-hectare rainforest reserve in Guyana. London-based Canopy Capital is effectively banking that the services generated by a living rainforest—including rainfall generation, biodiversity maintenance, and water storage—will eventually see compensation in international markets. The deal is unusual in that 80 percent of the profit will go to local communities through micro-credit loans to sustainable economic activities, according to Iwokrama. Another 4 percent will go to the Global Canopy Program, an alliance of 29 scientific institutions that seeks to better the understanding of tropical ecosystems. Hylton Murray-Philipson, director of Canopy Capital, says the deal seeks to develop a market for the “utility value” of living rainforests. Canopy Capital is working to develop an index so that forests around the world can be easily evaluated for their worth as an intact ecosystem. The beauty of the system is that it provides direct incentive for facilitating conservation efforts. Another example comes from the island of Borneo where New Forests, a Sydney-based investment outfit now backed by Al Gore’s private equity fund Generation Investment Management, has established a wildlife conservation banking scheme based on the rehabilitation of a degraded forest reserve. The company says it expects to earn annual returns in the 15-25 percent range by selling “biodiversity conservation certifications” to palm oil developers, energy firms, and other businesses seeking to improve their environmental credentials. The funds will endow a perpetual conservation trust that will finance efforts to reduce forest fires and restore the rainforest canopy. “We hope that via a commercial approach to conservation, we may be able to contribute to a sustainable landscape on Borneo that includes palm oil, timber production, and wildlife conservation, all being managed on a commercial basis in harmony,” David Brand, managing director of New Forests, said. The examples suggest that a market for ecosystem services is indeed emerging and could prove to be a model for financing large-scale conservation while simultaneously providing profit opportunities for private firms. While corporations pursuing commercial interests could end up protecting global forests, poor countries could have a new way to capitalize on their natural assets without destroying them. “Forests fall because they are worth more cut down than standing. This is a classic example of a market failure, but ecosystem services could change that,” he added. Ecosystem services payments hinge on the capacity of ecosystems to continue to provide services. Turning back to the Amazon, a question that emerges is how much forest needs to be conserved to avoid diminishment of the services if affords humanity. Dr. Nepstad suggests we are already approaching a critical tipping point. Brazil’s target – a 70 percent reduction in net deforestation over the 1995-2005 baseline by 2018 – is less ambitious but is an acknowledgement of both the importance of maintaining substantial forest cover in the Amazon and the potential of forest carbon as an economic asset. Beyond the rise of compensation for ecosystem services, there are other signs that deforestation can be slowed, including improved fire management by large-scale landholders, growing concern in some commodity markets about the environmental performance of developers, new opportunities for sustainable development and gains in productivity, and establishment of protected areas in regions where development is expanding rapidly. Dr. Nepstad says that landowners in the Amazon—especially those with fire-sensitive investments like orchards, intensive-cattle operations, and managed timber harvesting—are curtailing the use of fire as a land-management tool, reducing the incidence of fires that escape into neighboring forest areas. At the same time, positive signs are coming from industry. Soy and beef producers are responding to new emphasis on environmental performance from commodity buyers—soy growers in Mato Grosso are adhering to a moratorium on clearing of rainforest for soy production, while cattle ranchers are forming their own certification system for environmental standards. The Brazilian government has recently lent support to these efforts by cracking down on illicit commodity production in the Amazon, sending in troops while implementing fines and threatening credit access to landowners who buy or trade soy, beef, and other products produced on illegally deforested lands. Still, the Brazilian government needs to do more to improve governance by rooting out corruption and enforcing existing laws. Such efforts should take advantage of the country’s state-of-the-art satellite monitoring of the Amazon, which gives Brazil has the capacity to monitor from above. To be effective, Brazil needs to follow through with on-the-ground enforcement, but commodity certification systems may help substitute for governance when law enforcement falls short. For example, in the state of Mato Grosso some cattle ranchers have turned toward an initiative led by Aliança da Terra, a Brazilian nonprofit, to take the place of a failed governance regime. Aliança da Terra seeks to create financial incentives for producers who abide by Brazil’s strict but irregularly enforced laws requiring landowners to keep 80 percent of their land forested—a limitation no rancher elsewhere in the world faces. Aliança da Terra aims to turn this restriction into a marketing advantage by guaranteeing to buyers that its certified beef is produced legally and sustainably, sometimes in excess of legal requirements. The incentive for producers is market access: Aliança da Terra helps Brazilian farmers and ranchers get the best price for their products, but only if they follow the rules. While producers get higher prices for their goods, buyers can say they are using legally and responsibly produced beef. Consequently the program ensures that more rainforest is left standing, preserving more ecosystem services and biodiversity than would otherwise be the case. But for such certification systems to work, there must be buy-in from consumers. Now that Amazon deforestation is increasingly driven by industry, rather than subsistence agriculture, environmental advocacy groups can take advantage of corporate sensitivities to public image without the risk of undermining the livelihoods of millions of rural poor. In other words, the economic transition occurring in the Amazon has effectively given NGOs new leverage in consumer awareness campaigns. Apart from U.S. policies, international approaches to addressing deforestation in the Amazon will fail unless they recognize Brazil’s rights as a sovereign nation. While staunchly defending its right to develop its resources as it sees fit, Brazil has come around to the idea that preserving at least some of the Amazon is not at odds with economic growth. In fact economic integration of the Amazon as a viable ecosystem could augment livelihoods for some of Brazil’s most desperate people. Reining in new clearing doesn’t necessarily conflict with economic growth through agricultural expansion in Brazil. By government estimates, the country has some 50 million hectares of degraded but arable pasture that could be used for soy and cane cultivation. More rational utilization of already cleared and degraded areas, combined with intensification of soy and cattle production, will help reduce the need to clear forest land. A particularly promising path for boosting fertility and productivity in Amazonia is biochar farming techniques similar to those used by pre-Colombian populations. The so-called “terra preta” soils offer the additional benefit of sequestering carbon, helping reduce atmospheric concentrations of CO2. Indigenous involvement in reducing Amazon forest loss does not start and end with terra preta. Indigenous groups control more than a fifth of the Amazon and will be a key part of any “solution” to deforestation. These groups have fought for decades to win rights to the forest land they have used for countless generations. If they choose to preserve it, they should be fairly compensated. REDD may be the ideal vehicle for such compensation, funding sustainable development initiatives and the employment of indigenous park guards. Already some indigenous groups in the Brazilian Amazon – including tribes in the Xingu and Acre – are experimenting with carbon finance as a way to preserve the forests they steward. Recent research has shown that indigenous reserves are particularly effective at slowing forest clearing in high-deforestation frontier regions. A study by researchers at the Woods Hole Research Center and the Instituto de Pesquisa Ambiental da Amazonia found that the incidence of fire and deforestation within indigenous reserves was half that of surrounding unprotected areas. Dr. Mark Plotkin, an ethnobotanist who heads the Amazon Conservation Team, a group that works with tribes to protect rainforests in Suriname, Colombia, and Brazil, agrees. “The best way to protect ancestral rainforests is to help the Indians hold on to their culture, and the best way to help them hold onto their culture is to help them protect the rainforest,” he added. But it will take more than just indigenous reserves to save the Amazon. There is no magic bullet. A plan to sustainably manage the Amazon must be multi-faceted, involving a multitude of stakeholders including native people, poor colonists, and industry. The loss of more than 150,000 square kilometers of forest over the past eight years has shown that a business-as-usual approach will not be enough to conserve the bulk of the Amazon. Forests must offer tangible economic benefits in order for them to be protected as intact ecosystems. The ecosystem services market may be the best near-term mechanism for realizing this value. At the same time, improved governance, new market-based compensation systems that reward environmental performance, and continued expansion of protected areas will be key to saving forests like the Amazon. Rhett Butler is the founder and editor of mongabay.com, an environmental science and conservation news web site. This story originally ran on the mongabay web site, and can be accessed in its original form here.